Robotic arm technology just got a little more interesting with hydro-mechanically fun. With Hydraulic Arm Edge, you will command six axes of varied movements: the gripper to open and close up to 1.89 inches, wrist rotation of 180 degrees, wrist mobility of 98 degrees, elbow range of 44 degrees, base rotation of 270 degrees, and shoulder motion of 45 degrees. 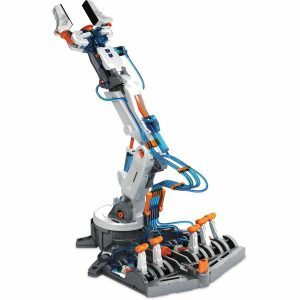 With a vertical reach of 16.35 inches, horizontal reach of 12.42 inches, and lifting capacity of 50g, your robotic friend is ready for your genius to erupt. With the removal of the gripper, you can activate the suction apparatus. This feature enables the user to elevate objects with a larger surface area (like a small mobile phone). Another prodigious attribution is a braking system that is integrated in the lever controllers to execute all commands accurately. WOW! How does this equate to fun? Your children will have total command and manipulation using the science principles of a Hydraulic system and its application. Easy to follow instructions with detailed graphic illustrations pave the way for successful and satisfying kit building. Compliment your engineering, math, science, and technology (STEM) learning strategy. No battery or motor required. It is powered by water; thus, the “Hydraulic” significance and how it manipulates axes movement via lever controllers. – For more than 3 decades, OWI continues its pursuit to satisfy educational instructors and the most discriminating parents. Hydraulic Arm Edge is recommended for ages 10 and up, but with its 229 assembly parts, it will challenge the beginner engineering enthusiasts. This entry was posted in Quadcopter and tagged hydraulic arm edge by qcopterpilot. Bookmark the permalink. Copyright © 2019 Quadcopters Flying Squadron All Rights Reserved.